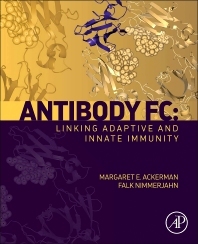 Antibody Fc is the first single text to synthesize the literature on the mechanisms underlying the dramatic variability of antibodies to influence the immune response. The book demonstrates the importance of the Fc domain, including protective mechanisms, effector cell types, genetic data, and variability in Fc domain function. This volume is a critical single-source reference for researchers in vaccine discovery, immunologists, microbiologists, oncologists and protein engineers as well as graduate students in immunology and vaccinology. Antibodies represent the correlate of protection for numerous vaccines and are the most rapidly growing class of drugs, with applications ranging from cancer and infectious disease to autoimmunity. Researchers have long understood the variable domain of antibodies, which are responsible for antigen recognition, and can provide protection by blocking the function of their target antigen. However, recent developments in our understanding of the protection mediated by antibodies have highlighted the critical nature of the antibody constant, or Fc domain, in the biological activity of antibodies. The Fc domain allows antibodies to link the adaptive and innate immune systems, providing specificity to a wide range of innate effector cells. In addition, they provide a feedback loop to regulate the character of the immune response via interactions with B cells and antigen-presenting cells. vaccinologists, immunologists, microbiologists, oncologists, protein engineers, in academic and industrial research institutions; graduate students in immunology and vaccinology. ADCC in Infectious Disease: A Correlate of Protection? Margaret E. Ackerman studied molecular engineering at the Massachusetts Institute of Technology under K. Dane Wittrup, followed by postdoctoral studies at the Ragon Institute of Massachusetts General Hospital, Massachusetts Institute of Technology, and Harvard University under Galit Alter. She was appointed an Assistant Professor of Engineering at Dartmouth College’s Thayer School of Engineering in 2011, and an Assistant Professor in the Department of Microbiology and Immunology at Dartmouth’s Geisel School of Medicine in 2012. Her research group applies protein engineering, molecular biology, and mathematical modelling tools to design enhanced antibody therapeutics and and vaccines. Falk Nimmerjahn studied Biology at the Universities of Bayreuth, Erlangen-Nuernberg and Munich in Germany. After his postdoctoral studies in the laboratory of Jeffrey Ravetch at the Rockefeller University in New York from 2004-2007, he was appointed as an Associate Professor at the University Hospital of Erlangen in 2007. Since 2010 he has been a full Professor of genetics and chairman of the Institute of Genetics at the University of Erlangen-Nuernberg in the Department of Biology. His research focuses on understanding the molecular and cellular mechanisms of mouse and human IgG activity. He authored more than 80 peer reviewed papers and several chapters in text books. For his work on immunoglobulin activity he was awarded several prizes, among them the Paul-Ehrlich and Ludwig Darmstädter Award for young scientists.